Do you drink as much water as you should. I can honestly say that my whole family tends to be pretty bad about getting our water intake. It doesn't help that the tap water around here lately smells like a swimming pool. It is so chlorine scented that you are almost afraid to bathe in it. I mean, what is in the water that requires that much chlorination to get rid of? Yuck! So, we've been buying bottled water, but the expense of doing that adds up quite quickly. So, I was thrilled when I was given the opportunity to review the PUR Flavor Options Pitcher. I've wanted some sort of water filtration for ages and was eager to try it out. 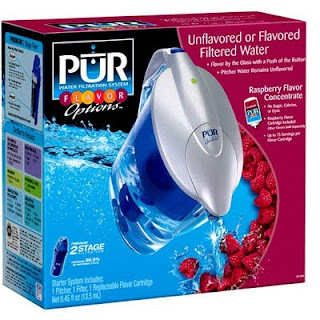 I was impressed after reading the PUR website and getting lots of good information about how the filter works, what contaminants it removes, and seeing that it was voted the Consumer Survey of Product Innovation 2009 Product of the year! They sure must be doing something right! So, my pitcher arrived and we started using it immediately. My opinion on this product? I do not know how we lived without it! It makes our tap water drinkable, something I honestly doubted was possible. The whole family is drinking lots more water, thanks to the fact that the water is now not gross. Plus, the Flavor Options have really helped make water more appealing to the kids. Ashley really likes the raspberry flavor. I love that the product works well, is made well, and has a sleek design that fits into the fridge door. I also really like that you can choose flavored or unflavored water. I was afraid it would all taste flavored, but was pleasantly surprised to find that wasn't the case.The PUR Flavor Options Pitcher has already saved us money that we would have spent on bottled water and I feel that it is helping us live better, as I no longer worry about my family drinking enough water. We give this one two thumbs up and a standing ovation! How would you like to have a PUR Flavor Options Pitcher for your own family? PUR has generously offered one lucky reader a chance to win one. Go check out PUR's website and leave me a comment telling me something you learned. You must do this or any other entries will not be counted! *Follow me as a public follower on Google Friend Connect. This earns you two extra entries, so be sure to leave two comments. *Leave a comment telling me how you found this giveaway. Are you a regular Ramblings reader? Did another site refer you? If so, which one? Inquiring minds want to know! *Become an RSS or email subscriber. This earns you two extra entries, so be sure to leave two comments. *Follow me on Twitter (link on left sidebar). This earns you two extra entries, so be sure to leave two comments. *Grab my button and post it on your blog, then leave me a comment with your site url. This earns you two extra entries, so be sure to leave two comments. *Blog about this giveaway with links back to this post. Be sure to leave me a link to your post. This earns you five extra entries, so be sure to leave five comments. * Fave me on Technorati (button on left sidebar). Be sure to leave me your ID in the comment. This earns you two extra entries, so be sure to leave two comments. Please be sure way I have to contact you if you win! Entry deadline is 8:00pm CST on Wednesday October 21. Winner will be announced and contacted on October 22. Good luck! Ramblings of a Texas Housewife Product Review and/or Giveaway Disclosure- I have received no compensation from PUR other than the offer of free product to review and/or giveaway. Any opinions expressed on Ramblings of a Texas Housewife are my own. My reviews are never reviewed or edited in any way by sponsors. PUR filtered water is about 1/10 the cost of bottled water. It removes 98% of the lead and reduces other contaminants. One thing I learned was that they have Flavor Options! I had no idea! Mel and I were just talking the other night about tap water vs. bottled water. I think he'd drink more water if we had a way to make it taste better! I learned that the PUR Pitcher removes more contaminants than BRITA! cdziuba@aol.com My email is easily seen in my profile. Today I was on online-sweepstakes.com and found your giveaway that way. Thank you for using Technorati Favorites! Technorati is collecting Favorites information as usual, however not currently displaying them in the site. Your submission was just saved. We are working on an upgraded Favorites system we think you'll like much better than the previous system. When we roll it out in the near future, all your previous favorite submissions will again be available to you. Thank you for your patience! If cost is a factor, Pur is about 1/10 the price of bottled water. The PUR Pitcher removes more contaminants than BRITA. I learned that it removes 98% of the lead and reduces other contaminants. I learned that using this pitcher is 1/10th the cost of bottled water.That along with the fact that by using this you also save the environment by not using the bottled water and dumping them into the trash where they end up in land fill is a major plus for me. 1 public follower on Google Friend Connect. 2 public follower on Google Friend Connect. Most Pur Systems come with a built in indicator to let you know when it is time to change. I am following via Google Friends Connect #1. I am following via Google Friends Connect #2. PUR removes more contaminants than Brita--we have used Brita pitchers for years! The PUR flavor options pitcher was voted product of the year. Enter me please. I learned using the pitcher is 1/10 the cost of bottled water. WOW! Thanks for the chance. This filtration system removes TWICE as many contaminants as the Brita system! I follow you on Google Friend Connect (2). I found out about this giveaway at Online-Sweepstakes.com! I follow you on Twitter @kristinnw. I follow you on Twitter @kristinnw (2). At their site, I learned that they have a Peach flavor. Yum. Please accept my entry. Thank you. It was voted product of the year. Thank you for the giveaway. I learned that PUR filtered water is about 1/10 the cost of bottled water and there are flavorings which is exciting because, you do get burnt out on regular water. The pitcher removes 96% of the bad stuff. PUR claims to remove more contaminants than Brita. I have a Brita now, and would love to try PUR because it has a flavor option, but now that I found out it's also purer, that's a good reason to switch in itself. I learned that most PUR systems has an indicator that tells you when to change the filter. I found this giveaway because I am a follower and stopped over to enter the Sound of Sleigh Bells book giveaway. I'm not sure how I missed this the first time around. #2 Got your button on the bottom of my blog page. I learned that although Pur filters out lead and other contaminants, it leaves the flouride in your water. I would have thought that would be filtered out as well. I found your blog through http://www.online-sweepstakes.com. Entering sweeps is a hobby of mine - with reading blogs a close second LOL. This is more effective than the Britta filters. I learned its certified to reduce twice as many contaminants as brita! I found out about this site through OLS a while back but have been reading for several months now. I got here because of a contest. According to the quiz I learned that my flavor is Crystal Clear. works better than the britta pitcher! They were voted 2009 product of the year. It removes more contaminates than Britta. I learned that Pur is Certified to remove twice as many contaminants as Brita. I found your site throgh OLS. The filter works for up to 2 months. It removes 98% of lead out of water! The PUR filtration removes 98% lead from water. I learned that they use a two stage filtration.Thanks! I learnd that PUR removes more contaminants than Brita. The PUR flavor options pitcher was voted product of the year.